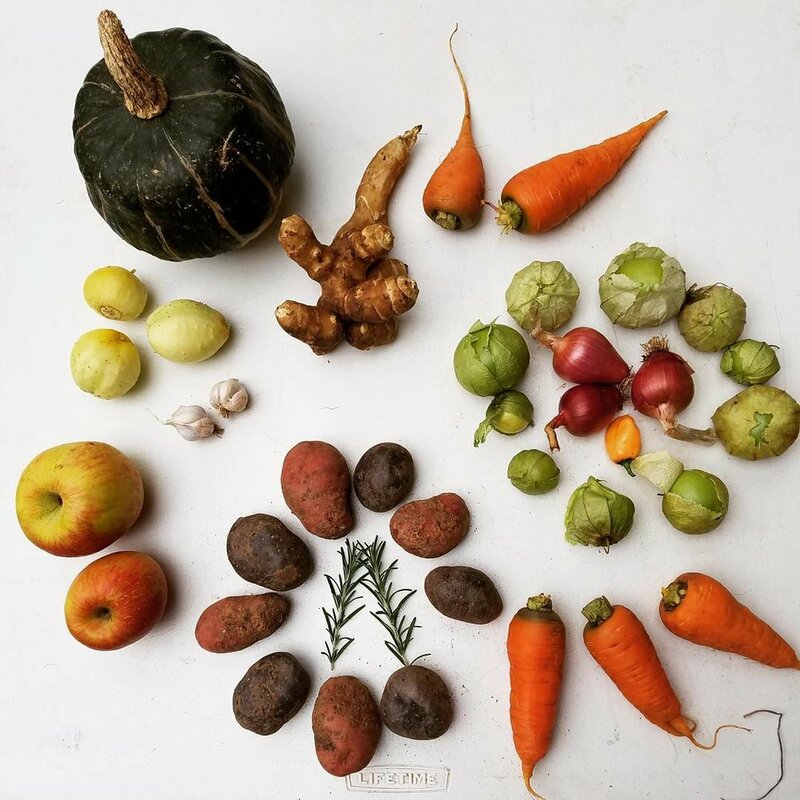 A CSA, or Community Supported Agriculture, was started in Japan as a way to "buy in" to a farm- you pay up front when the farmer needs money at the beginning of the season and receive the bounty as the weeks go on with a bag of fresh produce every week. If the farm does well, your bounty will do well, but if a drought, plague, or other natural occurrences affect the crop you help buffer the farmer's poor crop. If you love greens sign up for our early CSA- expect mostly arugula, spinach, salad mix, chard, Kale, and some additional goodies! Only a half size available for this season. The summer CSA sees the bounty of the garden, with an ever changing basket of goods including greens, broccoli, cabbage, onions, herbs, cucumbers, tomatoes, beans, carrots, and more! The bounty of storage crops with the addition of the last of the summer harvest, this CSA extends from fresh tomatoes and greens to storage roots and squash. You’re picking up a bunch of healthy veggies from your local farmer, you deserve to treat yourself thanks to Marisa from Buddy Bear Baked Goods (you know her stuff if you go to the markets)! The baked goods share will include one full loaf of bread per week plus one or two other baked goods. Or choose to just get a loaf of bread a weekSome possibilities include ginger molasses cookies, muffins, brownies, biscotti, shortbread, biscuits and many more. Gluten free and/or vegan options available upon request! $15.50/week for the full and $8.25/week for “Just Bread” for the 10 weeks the fall CSA happens. Our eggs come from Leonard Hostetler out of Hotchkiss, Colorado. These organic, pasture raised eggs eat a diet of sprouted barley and whatever they find in the field. "I doubt anyone else has eggs these good because no one else feeds them like we do," he said. 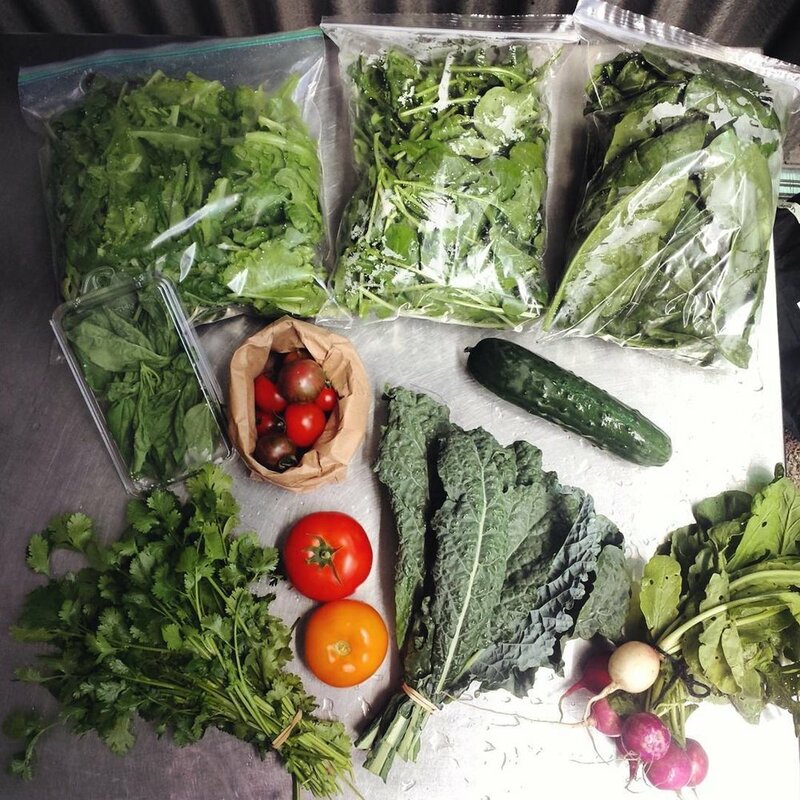 Our CSA members pick up their shares at the farm. This summer and fall, because of limited access with construction, members will pick up their share market style on Tuesday Afternoon/ Evenings from 4:00-7:00pm. Eggs- You can select to receive either a full dozen or a half dozen eggs to pick up weekly with your vegetable share. Our eggs come from Leonard Hostetler our of Hotchkiss, Colorado. These organic, pasture raised eggs eat a diet of sprouted barley- corn and soy free! Meat- Add a Nieslanik beef share to get grass-fed local beef out of Carbondale, CO! Each week you will be provided with a bag of vegetables and herbs from the garden and greenhouse. Half shares have an AVERAGE value of $20/ week and $35/week for full shares distributed throughout the season, determined by the specific vegetables and the season. I am an adventurous eater and would like to try new types of vegetables (we will let you know what they are so you can look up a recipe). By signing below I understand and agree to the following terms: I am responsible for picking up my weekly share on my pick-up day at the Roaring Gardens greenhouse. Shares are ready by 1:30pm on Tuesdays. I understand that there will be no refunds; I understand that I am sharing in the bounty as well as the risk of gardening in a high mountain, short season environment. I understand that the harvest depends on growing conditions and other environmental variables that may put limitations on quantity. - If I am going out of town I am responsible for arranging for my share to be picked up by someone else, or I can arrange with the Greenhouse Manager to donate it.